This ceramic teapot is in very similar colours and style of the Cubist sculpture by Edward Allington shown on our home page and also in more detail (Stock No. 213). 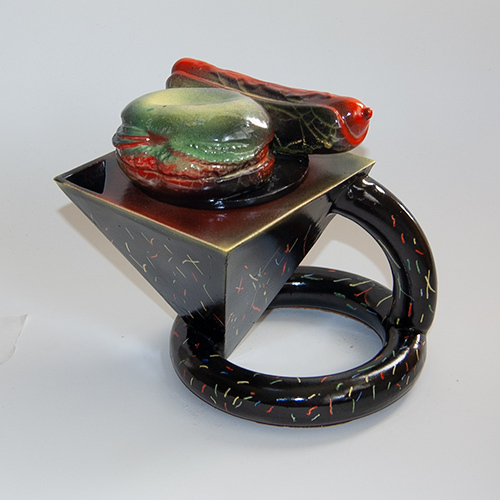 The burger and hot dog comprise the lid on top of an inverted 4 sided pyramid, forming the teapot's body which is supported by a coiled pipe structure. 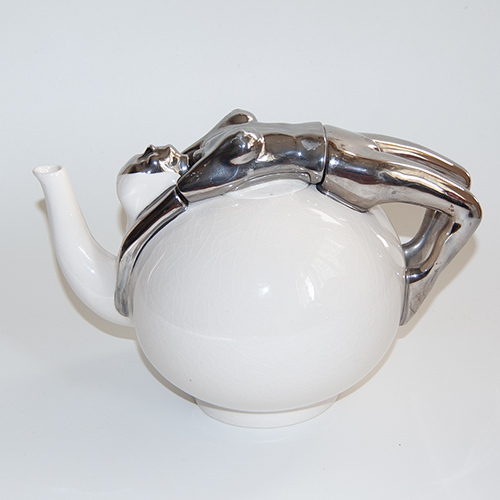 It is thus almost certainly a one off cubist structured teapot made for Allington's 2nd exhibition at the Paul Smith Gallery in the 1970s in which he displayed 30 - 40 Cubist creations. Hand signed to the top of the base ring in Allington's typical style.